To provide a family for the orphan of Uganda where lives are restored and hope is revived through the love of God. Chayah Children’s Home was birthed in the heart of a small group of short term missionaries as they loved on the children of Kakira, Uganda. Through that journey God began to implant a vision on their hearts and through much prayer, the vision has become a call to action …a reality. Our vision at Chayah is to see lives restored and hope revived by providing a safe, nurturing and loving place for them to grow. Chayah rescues Ugandan orphans from abuse/neglect, trafficking, victims of heinous acts, extreme poverty, abandonment and provides them a loving home. At Chayah, the children will be fed spiritually, socially, physically and emotionally and experience what it means to be loved selflessly. 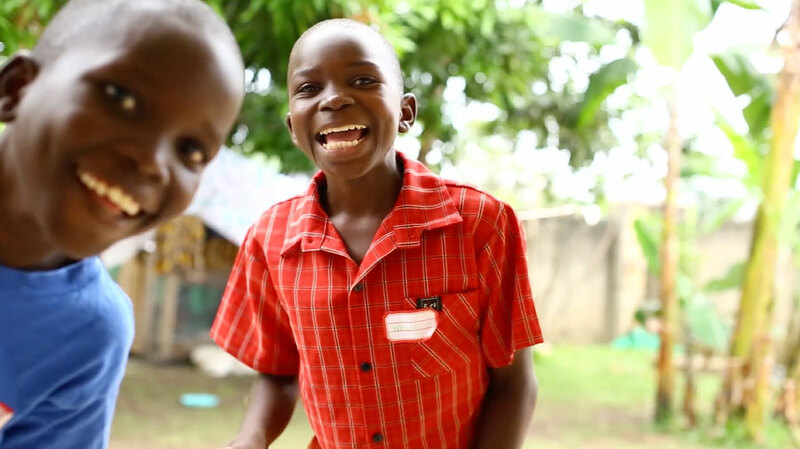 Believing children are the future change of Uganda, we provide them with the means to get the education they need both formally and spiritually while instilling in them a renewed hope that they can be the change. Olivia: In 2010, a young girl named Olivia, then 13, spent most of her days caring for her two young siblings in a small village in Africa. Her father, long gone, had been replaced by a new man. Her mother, carrying his second child, worked the ground each day to provide food for the family. In Uganda, a father in the home is rare, a legal marriage is uncommon and the idea of providing for a previous man’s child is beyond the desire or ability of most. Women are valued little, daughters less. So Olivia, sandwiched between two biological sisters, survived by living on the fringes of the family home and provision. Someone suggested Olivia attend a women’s conference in the neighboring village of Kakira. Travelling an hour by foot each morning, Olivia sat shyly near the back of the basement church surrounded by 200+ women gathering daily to listen to a group of missionary women teach about Jesus. One American, in particular, noticed the petite child by mid week and smiled in her direction. With each passing meeting, the timid girl moved closer to the front, where her Muzungu friend sat waiting to teach the next session. Why these two became a pair could not be attributed to commonality or conversation…they lacked both, as generations, oceans and languages separated their lives. But invisibly and without human effort, the Holy Spirit was binding their hearts together as mother and child. The praise and worship time each day was peppered with individuals sharing a testimony of God’s faithfulness, a dance expressing their gratitude or a song. Someone nudged the visiting child and suggested she go up to sing. With a smile that eclipsed her tiny frame, she went forward, and to a group of strangers sang “Soon and very soon”. Why she sang in English, how she knew the lyrics, when her own language was Luganda, only the Lord knows. Perhaps she was honoring her foreign guests as she offered her heart in worship. On the final day of the conference each attendee was asked to submit a written prayer request. Olivia’s simple request “I want you to pray for me, I am an orphan, no school fees”. She quietly turned in request #206 and this anonymous child returned to her own village. The American teacher, like mother’s do, went seeking the details of that one child’s plea to her maker and unfolded the tiny piece of paper that would prove to undo her heart and consume her thoughts. Janet: Kakira’s church hosted an organized week of teaching, testimonies and worship. Janet, a school teacher by trade and servant by heart, was the liaison between church and missionary team. Her humility and grace, as she served the visitors and her own church, was amazing. She was tall in stature, her slight figure evidence that she was giving away more than her heart to the people in her village. It soon became clear; these two American and Ugandan church girls shared a love for their savior and a passion for abandoned children. As the conference ended and the goodbyes began, Janet agreed to try to locate the child that she had neither met nor noticed during the busy week. She would find out whether her family would allow her to attend school if fees were paid by the American woman. With only a name, Abbo Olivia, she began a search of nearby areas, walking distances and through places and children completely unfamiliar to her, asking about this “Olivia”. When finally she heard a “yes” to the question “Are you Abbo Olivia?” she announced that an American woman wanted to pay her school fees, her search was over, but her desire to help make two dreams come true would not yet be accomplished. To Olivia’s dreamless heart, Her great God had answered her prayer. It was clear that there was more to this story than school. The evident neglect and poverty eventually led Janet to ask the parents for custody of both girls, Olivia and her younger sister. She would take them back to Kakira, where they could be fed, loved and where their education would be guaranteed. The adults agreed without issue… relieved of two daughters. Janet’s humble one room home, already occupied by three, now swelled to embrace, feed and educate two more. What causes a women of humble means, struggling to support her own younger sister and her own son, to stretch her arms and resources around these two tiny strangers? Only God. Over the next two years, texts and emails of gratitude and encouragement were exchanged between this American woman and her new Ugandan sister. Money was sent and accounted for to cover school fees. Report cards were shared along with news of the progress being made by the girls. An American mother’s heart was growing more tender to this extended family and the young girl who wanted to go to school. Trust and a great confidence was building toward this Ugandan woman who unselfishly chose to stand in the place of mother and return value to the lives of Olivia and her sister Jesca by taking them in. It’s not difficult to adjust to affection, attention and hope, even in cramped quarters and sharing a divided portion of rice and beans feels like a banquet when its served with the love of Jesus. How is it this single pair of sisters are rescued in the midst of a continent overflowing in orphans? In 2012, Unchanging Truth Ministries offered an opportunity to revisit the village of Kakira and the American woman whose heart was being transplanted there, one fiber at a time, made plans to return along with the team of 9 others. Preparations over several months prior would allow for another woman’s conference and a children’s conference. Excitement grew over the weeks leading up to the trip on both sides of the world. The Lord had answered the pleadings for this reunion and a chance to see each other face to face once again. It was far more wonderful than imagined, as the two years of separation became invisible instantly. It was a week packed with ministry opportunities. Being used of God, for his purpose wore on us physically, but bolstered us emotionally and spiritually. We talked about, sang about and celebrated the love of our wonderful Jesus and shared our hearts with children from 6 months to 16 years at a Children’s VBS and women up to their 60’s or 70’s (they were unsure of their age). We visited orphanages and ventured deep into villages. At every turn we were hit with the reality of great poverty and children trying so hard to survive, they had no energy or inclination to dream. As the week closed, and the team finished their commitment to the village, God began to open the curtain that dramatically revealed our true purpose and the vision He had been weaving together since the beginning of time. Three mothers, living continents apart, had been given identical callings: A God-given passion for the children of this village, who have been orphaned by death or abandonment, many living on little food, without education or medical care and hearts surviving and searching for hope when there is none in sight. It was as if the week’s end was really a beginning. We agreed to pray and begin a walk of faith in the name of Jesus and true religion (James 1:27) allowing Jesus to be the key to unlock all that He has for the beautiful children of Kakira, Uganda. Who sends everyday ordinary broken people to help a village whose children need supernatural saving grace and love? These wonderful children are the reason we do this. Here are a few of their stories. If you feel called to partner in what God is doing through Chayah Children's Home, here are a few ways to join. Give of your time and talents by joining us on a missions trip. Coming Soon!